How can philosophy, sociology, geographic information sciences, history, and political science work together to combat emerging public health crises? A group of faculty members and health officials from Southern Africa and the local area spent last week analyzing and discussing this very question. Part of a longer-term alliance, the events were funded by a Hall Network scholarly seed grant, which has supported five University of Redlands professors—Amber Bechard (now at the University of La Verne), Kimberley Coles, John Glover, James Krueger, and Eric McLaughlin—in creating a Southern Africa Corridor-themed framework for classes, faculty and student research, internships, and other opportunities. The gathering was also part of the U of R’s efforts to provide students with opportunities to gain a global perspective. “There is inherent value in our students experiencing higher levels of intercultural learning,” said Steve Wuhs, political science professor and assistant provost for internationalization. The week began with a focus on geographic information systems (GIS). 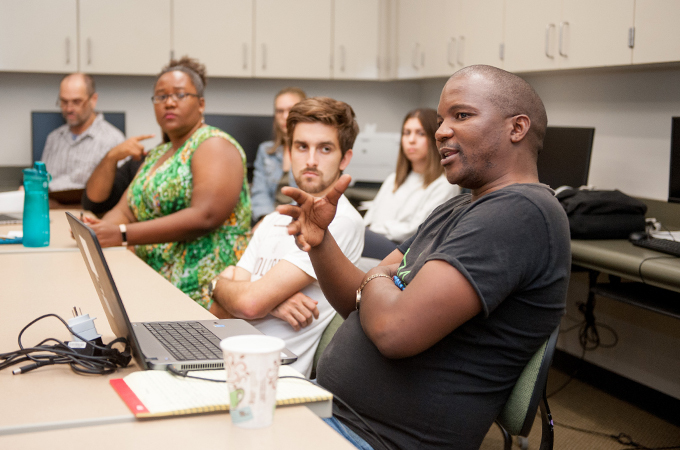 Guests from Eswatini attended Mapping Monday, a series of workshops and discussions hosted by the Center for Spatial Studies, before coming together with colleagues at the GIS hack-a-thon. 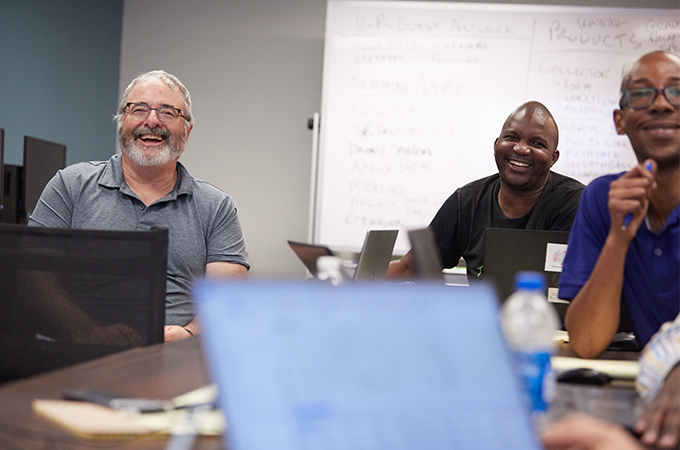 Participants in the hack-a-thon used real-world data collected by the Tuberculosis Control Program to explore how GIS technologies can be used to improve public health. At the hack-a-thon, participants worked on issues of data collection, cross platform migration and sharing, and data analysis. 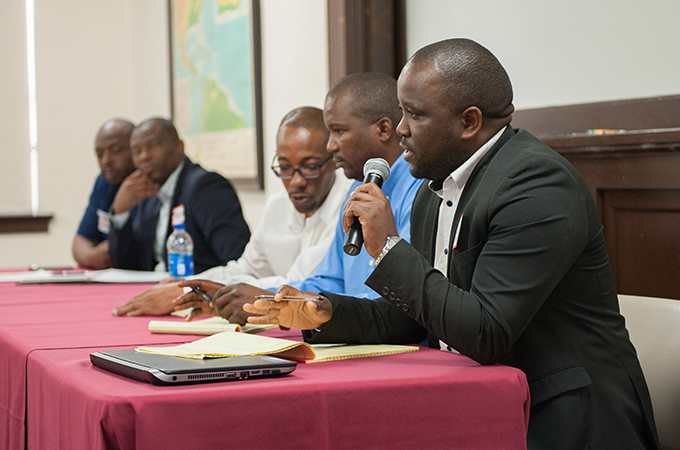 The week culminated with a two-day-long conference, titled Southern California, Southern Africa: Place and Practice of Health. Featuring nearly a dozen presentations from experts on history, philosophy, anthropology, and public health, speakers addressed the concepts of infectious disease, philosophy of medicine, information systems, and many other topics. “The University of Redlands does its best work when that work is interdisciplinary,” said Provost Kathy Ogren in her opening remarks. Later in the afternoon, Zinhle Mncube and Benjamin Smart, both from the University of Johannesburg, delivered presentations on the philosophy of medicine. Mncube argued for the practice of providing patients with individualized care, otherwise known as personalized medicine. Similarly, Smart emphasized that the concept of disease is not singular and that medical professionals need to be hesitant in viewing it as such. The final day of the conference was filled with presentations from Ministry of Health officials and university faculty members from Eswatini and the Inland Empire. Speakers from Eswatini emphasized the need for disease prevention and efficient data collection while addressing inequality, mortality rates, and poverty within the country. Advocating for patients was a theme of speakers including Celine Ko, professor of psychology at the University of Redlands; Tiffany Jones, professor of African studies at California State University, San Bernardino; and Jennifer Syvertsen, professor of anthropology at University of California, Riverside. Faculty members from the University of Redlands and the University of Eswatini hope to continue their collaboration with additional grant funding and are exploring the possibility of linking students in Redlands and Eswatini through collaborative online learning technologies.